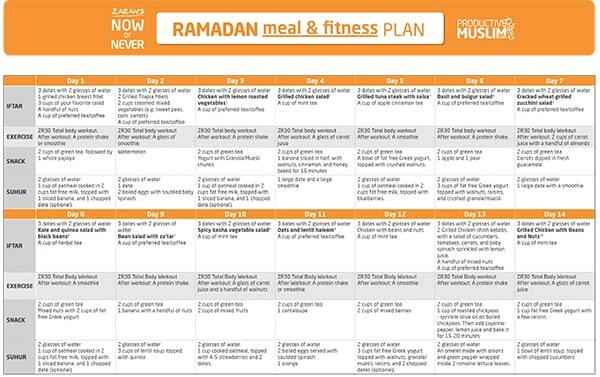 The Fasting and the Fit: 30-Day Ramadan Meal and Fitness Plan - The Maghreb Times ! Learn how you can stay fit while fasting by following a special 30-day Ramadan meal and fitness plan. During Ramadan, apart from worship and concerns of how to spiritually improve oneself, a lot of people get preoccupied with what they will cook or prepare for iftar and suhoor for thirty straight days. The numerous shopping trips start a week or two before Ramadan. During the first few days of Ramadan, some people prepare the most lavish meals without thinking about how it will affect them later on, especially when they need to stand up for long taraweeh prayers. In this article, we will discuss Ramadan’s numerous physiological and lifestyle-changing benefits and how you can stay fit while fasting: by following a special 30-day Ramadan meal and fitness plan. Intend that this Ramadan of yours will not be another food festival but one that you will use to get your fitness and weight back on track, in sha Allah! , so when it is over we stay on the right track and continue the good deeds and habits we developed during Ramadan. Whether it is Ramadan or not, my food concerns are the same. We fast for the sake of Allah , so personally it is not important for me to reward myself with excess hours in the kitchen, when my true rewards are already written down with Allah . Therefore, since I primarily focus on enhancing myself spiritually, my food consumption is the same as any other day throughout the year. Though I do not focus much on food consumption during iftar, I know it is crucial to have a proper diet. Most of us have different schedules during Ramadan, whether due to work or school. For those of us who cannot stay up all night, we need proper sleep along with proper food intake to allow us to fast and last the following day. With the change in eating routines and habits, we may be oblivious to the fact that we could be putting on weight. We do not have the time to workout, nor do we focus on clean eating. It is Ramadan of course, so we have the belief that indulging in greasy foods for iftar/suhoor will give us energy throughout the day. The whole idea that greasy foods give us more energy is incorrect. In fact, heavy greasy meals make you feel fatigued faster when standing for long prayers. Crash rates with greasy fatty foods are higher than clean foods. Simply look for the right foods. What are the right foods? The right foods will always be earth-grown greens that are nature’s cure and answer to most diseases and illnesses out there. 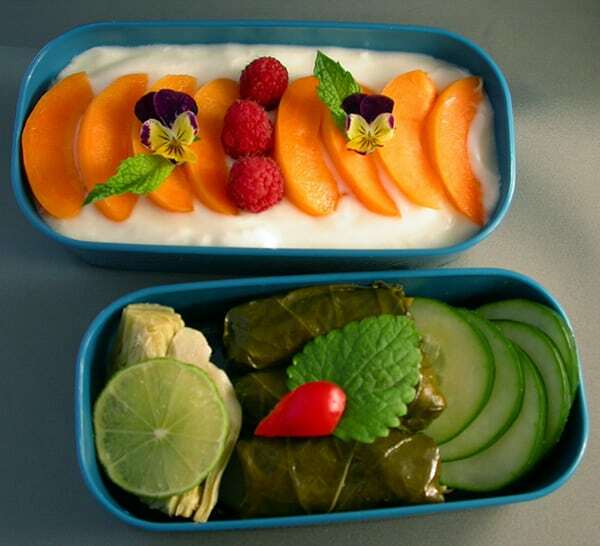 You should stock up your fridge and pantries with fruits for Ramadan rather than fatty, fried and junk food. Who says it has to be boring? You just need to be creative just as you are with unhealthy items. To help you out, I’ve shared many sample ideas below that will help you prepare your own healthy iftar options in sha Allah. This will give you a better idea of what to prepare and how it can benefit you throughout Ramadan. Ramadan is an excellent time to start your physical fitness journey while you are on a spiritual journey to get closer to Allah . Fasting has numerous physiological benefits and supports weight loss by giving you a chance to re-assess your meals and improve your eating patterns. Portion control was suggested more than 1400 years ago by our beloved Prophet , long before the weight loss craze began. If we truly follow this golden advice from our Prophet we will not be eating mindlessly and filling our stomach until it is full, which will inevitably lead to weight gain, laziness and lethargy. For those who binge all day or cannot control binge eating disorders, fasting helps you increase your self-control and overcome your food addiction because it forces you to eat only when it is allowed. Therefore, your body gets accustomed to this new change after a few days. Naturally, fasting helps you find and adopt a pattern that is healthier to stick to afterwards, In sha Allah. Fasting can be a safe way to lose weight as many studies have shown that intermittent fasting – fasting that is controlled within a set number of hours – allows the body to burn fat cells more effectively than just regular dieting. So after a day of fasting, it will be more effective if you exercise for at least 30 minutes, with a particular focus on cardio. You will be burning more body fat during fasting days versus non-fasting days, because intermittent fasting allows the body to use fat as its primary source of energy, instead of sugar. Now even many athletes use fasting as a means to hit low body fat percentages for competitions. Some people are under the impression that fasting starves the body and hence you go into “starvation mode”. That is not true. Fasting is not starvation. It is simply not eating or drinking for a period of time, not continuously for days on end without basic nutrients. Have you noticed that during Ramadan our bodies feel more rested? It is because fasting gives your digestive system a rest, and this can energize your metabolism to burn through calories more efficiently. If your digestion is poor, this can affect your ability to metabolize food and burn fat. Fasting can regulate your digestion and promote healthy bowel function, thus improving your metabolic function. According to some researchers, not eating anything for just one day has shown to help the body clean up the toxins and regulate the functioning of other organs of the body including liver and kidneys, health expert, Nathan Hewitt, mentioned in one of his articles. Although fasting has numerous benefits that have been established scientifically, it should not be a permanent solution to weight loss since the initial appealing factor of fasting and experiencing weight loss is quick fluid loss, not substantial weight loss. If it was easy, it would come back just as quick when we go back into our normal routines. So just keep that in mind: fasting helps you jump-start a weight loss process and it is not a permanent solution. For all those wanting to lose or maintain their weight without feeling weak or fatigued while fasting or standing for long prayers, here’s a special 30-Day Ramadan Meal and Fitness Plan I’ve prepared. The plan offers simple, delicious and healthy meal suggestions for iftar, suhoor and snacks for the entire month of Ramadan along with a suggested workout slot everyday. It also includes 10 super-easy and tasty step-by-step recipes so you have no excuse not to plan your Ramadan fitness journey now and stick to it! Follow this plan as closely as you can and In sha Allah you will not gain weight but in fact shed some and remain fit and healthy during and after Ramadan! There are alot of ladies who do not want to or can’t go to the gym during Ramadan due to limited time remaining after iftar. Hence, they are prone to weight gain and feel more miserable while fasting and attending taraweeh prayers. You do not have to feel that way this Ramadan, In sha Allah. To ensure that you can workout in the comfort of your own homes and at your own convenience, I’ve created some workout videos to help you workout everyday and keep your fitness on track this Ramadan. These videos are specially designed for stay-at-home mothers. The “Run with Zarah” 30-minute video is available for all ladies and can be found on YouTube and Dailymotion. I hope you’ll take advantage of this Ramadan firstly to enhance yourselves spiritually, and then to kick-start your fitness journey and get in shape through the numerous health and weight loss benefits of fasting. What are the positive results you experience in Ramadan with regard to your health and fitness? Share with us in a comment below!